Seattle Mayor Ed Murray will reduce the controversial $160 million price tag for the Police Department’s new North Precinct to $149 million. And a majority of the City Council’s members will apparently support the project at that cost. Seattle Mayor Ed Murray’s budget director told a City Council committee Wednesday that the mayor will reduce the controversial $160 million price tag for the Police Department’s new North Precinct to $149 million. And a majority of the council’s members will apparently support the project at that slightly scaled-back cost. Speaking to M. Lorena González’s public-safety committee, budget director Ben Noble said the price tag can be cut by halving the size of the new precinct’s parking garage and by waiting, if necessary, to build out a basement training facility for officers and to install some solar panels. The garage change will shave about $7 million off the project and holding off on completing the training facility and solar-panel setup will net another $4 million, Noble said, giving estimates slightly different from what the council’s central staff came up with last month. 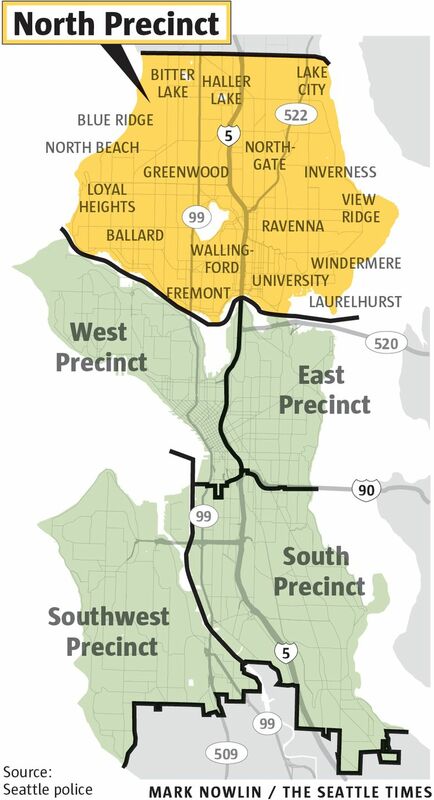 The city has for many years been inching ahead with a plan to build a new North Precinct at Aurora Avenue North and North 130th Street to oversee all the police department’s operations north of the Lake Washington Ship Canal. The project is needed, according to officials, because the existing North Precinct at College Way North and North 103rd Street has long been overcrowded and dilapidated. Noble and other Murray officials went hunting for savings recently amid public outcry over the precinct’s eye-popping price tag and council members’ concerns. Councilmember Mike O’Brien suggested last month the city might want to shelve the project indefinitely, and some citizens upset with the $160 million plan have been energetically organizing to stop it, slamming the planned precinct as a “bunker” for a police force undergoing court-ordered reforms related to excessive force and bias. O’Brien didn’t take part in Wednesday’s discussion, due to a prior commitment. But members of the public opposed to the project — including activists holding signs with the slogans “Black Lives Matter” and “Block the Bunker” — showed up in force. More than 40 people spoke, many urging the council to prioritize other needs. “The money for the bunker could be much better (spent) in recruiting police officers from the communities they actually serve,” Kirsten Harris-Talley said during a sometimes raucous, hourlong comment period, reading a statement by someone who couldn’t attend the meeting. Despite the vigorous criticism leveled at the project by speakers Wednesday, it appears the $11 million reduction will be enough to win the council’s approval. González has been working on a resolution that would cap the budget and direct the city to perform a racial-equity analysis of the precinct’s operations. On Wednesday, she said she intends to put that resolution to a vote next week with a cap of $149 million, retaining the mayor’s April 2017 target for construction to begin. And González indicated that at least four of her council colleagues — Tim Burgess, Debora Juarez, Sally Bagshaw and President Bruce Harrell — will support the resolution, seemingly assuring her a majority on the nine-member council. In a blog post Wednesday, González said a cousin of hers was fatally shot by law enforcement long ago, and she acknowledged that for some, the project “represents a legacy of institutional racism in policing.” But not building a new North Precinct, she wrote, will not undo that legacy. Debate over the precinct sparked a testy exchange Monday between two council members. Juarez noted that the city has a duty to provide public safety for its citizens. Questions about the new precinct and its price tag first erupted in April, when the mayor, in outlining a new funding strategy, noted that the cost would be $160 million. Officials had initially budgeted about $89 million for the project. Last year, the council signed off on the updated price tag of $160 million but without much scrutiny. It was one project among many included the city’s voluminous Capital Improvement Program.